At long last, the thrilling conclusion of the School for S.P.I.E.S. series is here. 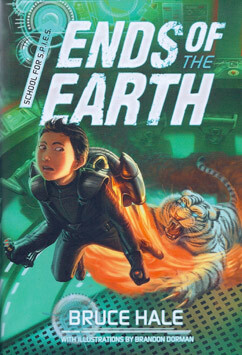 ENDS OF THE EARTH hit bookstores yesterday, and now you can learn the fate of Max Segredo, his father, and friends. When we last left him, Max was in a bad spot, and now things are even worse. His team has been scattered to the winds, his father has gone missing (again), and the Merry Sunshine Orphanage has burned to the ground. Max is under lock and key at LOTUS headquarters. Worst of all, the evil organization’s chief, Mrs. Frost, wants to adopt him. Max would go to the ends of the earth to be a normal kid with a normal family. Good thing, too. Because to achieve his goal, he must first evade a hungry tiger, learn to fly a jetpack, reunite with his friends and father, and use all his mad spy skills to stop LOTUS from taking over the government with a mind-control device. Should be a snap, right? Well, not exactly… Find out what happens in ENDS OF THE EARTH, available at bookstores now! will you make a 4th book? i hope so if so when? I’m glad you’re enjoying the series. Right now, we have no plans for a fourth book, as I wrapped things up pretty well with the third book. But you never know — it’s always possible to send them on another mission! Just finished reading the book! In fact i’m now doing a book report on it. Glad to hear it. Best of luck with your report! you should make a movie i wold say pg. Thanks, Isaiah. That’s a great idea — I’d love to make a movie of School for S.P.I.E.S.! So glad to hear that, Emily! Ashlynn, I’m glad you’re enjoying my series. Sadly, that’s all there is for now, although I’d love to write a tale where Max and his dad tackle a mission together. i loved your playing with fire book! I’m exited to read thicker than ice and ends of the earth! they both sound like really good books! you are such a talented author! Thanks so much, Katelyn. I’m glad you enjoyed the first book. Luckily, you don’t have to wait for Books 2 and 3, since they’re already out!